How much is my business worth? It’s a question every entrepreneur, founder and business owner asks themselves. This is particularly true during acquisition conversations with a prospective buyer. Because most companies are privately held, the acquisition details of the roughly 10,000 businesses who sell themselves for less than $500M each year in the US remain hidden. 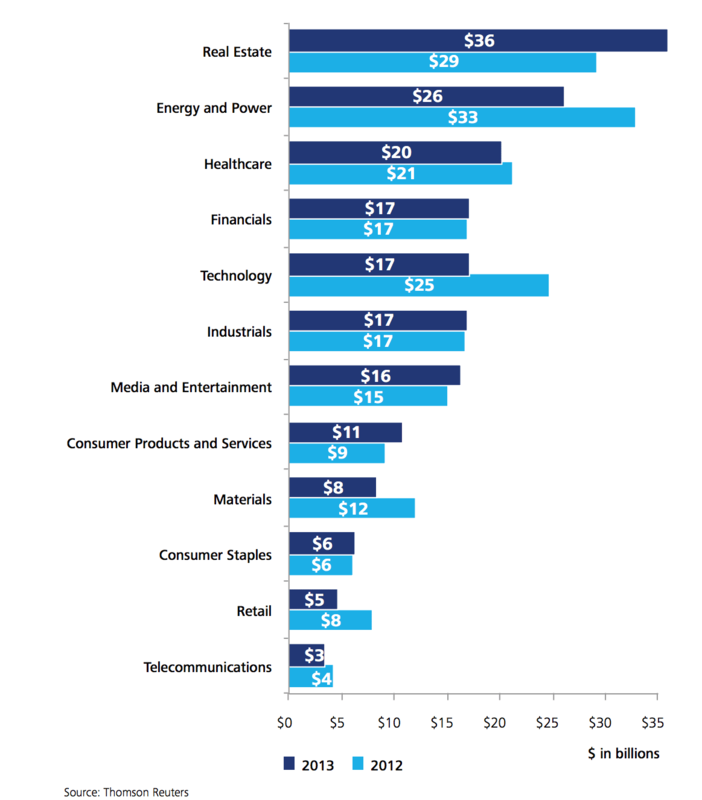 There are enormous forces at play in the M&A market that indicate M&A activity will increase substantially in the next few years. Consequently, every business leader ought to develop and maintain a good understanding of their business’ market value. 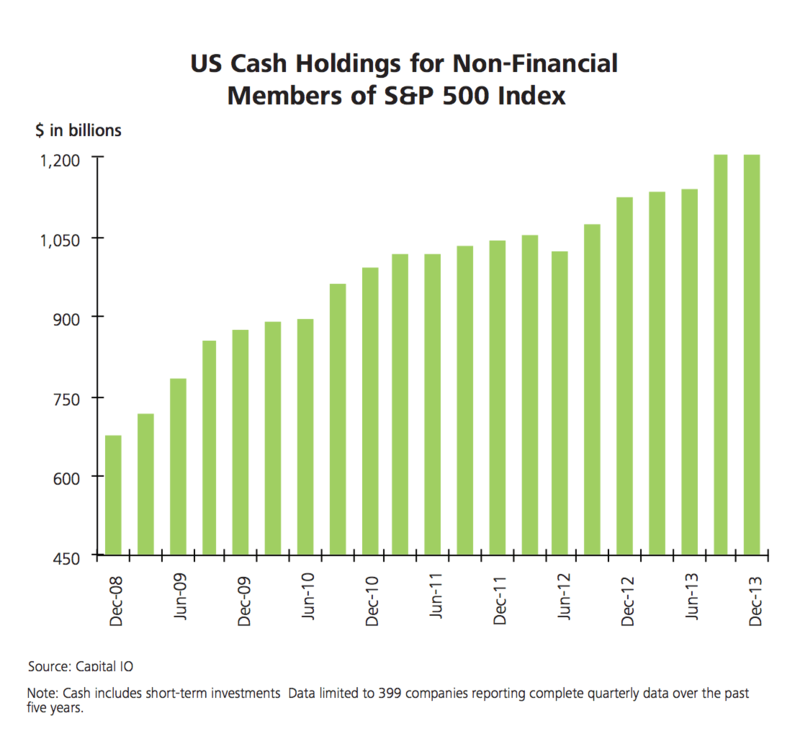 As the data in the chart above shows, the amount of capital held by large public companies has roughly doubled from $675B to $1.2T in 5 years, a burgeoning war-chest that will fuel increasing M&A activity for years to come. In addition to an abundance of public company capital for acquisitions, private equity firms have amassed a 10 year high of $412B in dry powder, more capital for M&A. Two years ago, we invested in Axial, a company which has capitalized on these trends and has since become the largest market place in the US for M&A transactions, with more than 200 businesses joining the platform each week. Today, Axial released a valuation tool to help CEOs all over the US estimate the value of their business. 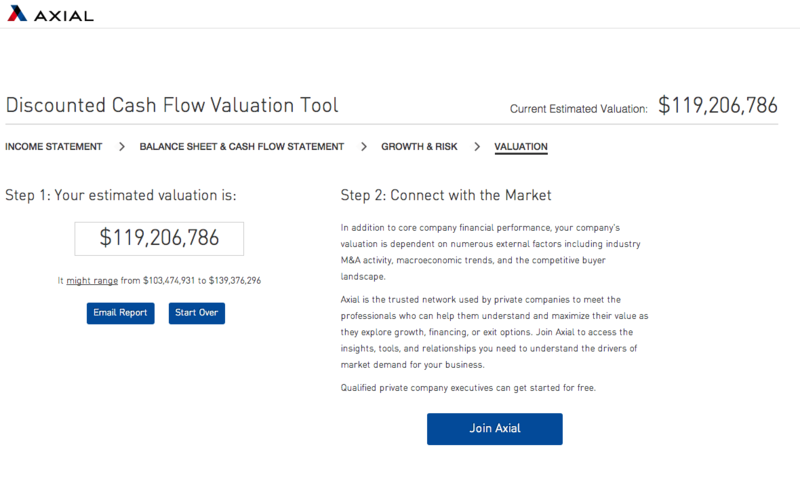 Axial’s Valuation Tool uses discounted cash flow analysis and collects a few bits of information about a company to provide a Zillow-like Zestimate of a company’s value. Because the DCF model uses profitability as a core variable, the estimator won’t work for many startups whose main concern is growth. But for the millions of businesses in the US which do generate a profit, Axial’s Valuation Tool works very well. In addition to helping business owners understand the value of their business, Axial connects business owners with acquirers, lenders and investors, providing entrepreneurs clarity in a traditionally opaque market. Last, the company provides advice and guidance on how to start and manage M&A processes. The Internet has a unique ability to create more efficient market places and networks. We’ve seen it with classifieds and collectibles, real estate and resumes. Axial’s ambition is to do the same with in the $200B annual M&A market, by helping founders and CEOs maximize the value of their companies.